wwii axis reenactment forum • View topic - opinions on makers stamps ect. Post subject: opinions on makers stamps ect. 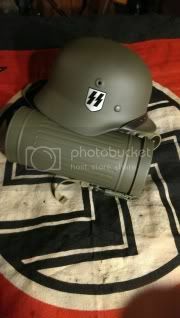 I recently bought a M40/55 Finnish contract stahlhelm. These are German made but minus any manufacturer Stampings..I ordered everything I need to refurbish this helmet to make it a M40 SS single decal. I'm looking for the most probable markings found in a reissued M40. I plan to stamp this one my self and would like to be as accurate as possible. I'm sure with some effort I can track down number and letter stamps with the correct look and size. Any recommendations? On a side note: these helmets were painted with a pink primer,then coated grey. I'm going to buff that out entirely with very fine grade paper by hand,and then coat it once with 1944 Militaria's feld dunkel for M35s and M40's. (early war) then another layer,probably whitewash for winter combat,then again with a few coats of the Feld dunkel again and apply the decal. (with the idea that the decal was not factory done but a private purchase) then scuff and bang up the helmet a bit for the diffrent layers to show so it looks as though it's seen some Shiessa. And then finally do woodchip camo and scuff that a bit so the decal shows through a bit. Post subject: Re: opinions on makers stamps ect. My opinion is that you should leave the helmet as it is. From a collector's perspective, especially for the benefit of new collectors, it's very unfair and misleading to do something like this. I'm sure that it is not your intention to falsely mark your helmet to increase it's value, however, think about the future, where a situation might crop up and you have to part with your helmet. Will the intentions of the next persons be legit? The same thing holds for marking up very accurate reproductions. It's very ethical that you not falsely mark the repro items with period makers. Either choose to leave it blank, or go for something that does not mislead the collector in anyway. Serious reproduction vendors adopt this system, going for the initials of the store. Items that are contracted by me would have the maker "LWS", which in the Third Reich era was a newspaper firm. Fair enough. I certainly have no intentions of selling this helmet ad it's part of my kit,but when I pass on I can see where it would become an issue. M40/55s are collectible on their own right too so leaving it as such would be fine too. As for the paint schemes,opinions? Sorry for the late reply, didn't notice. yes a red, (not pink ) is a good way to start. An m40 helmet would not be so glossy so don't over do it with the buffing. Depending on your impression, the later war it is, the more matt and textured the paint would be. Again, the field grey is a very dark grey colour, with a tint of green. Again, the late war you go, the less green it is. BUt it's still recognisable from the blu-gray of the Luftwaffe. for an m42, a late war tan as a base is good as well. But camouflage can be applied with various paints. I suggest that you apply the decal before you do the camo. Even if it's private purchased, it's best to apply the decal first, and apply the camo later. I have restored m38 helmtes with this process. I can show you pictures if you want.